Managing A nice but lonely profession? Advising during change processes, talent development, career guidance, improving interviewing techniques, HR trainings: these are just a few examples of the support we offer to organisations. People are the primary focus of Dialogis. Based on this key approach, we start working for you and your employees. Regardless of your requirements, and even if they are not entirely clear at the start, we will gladly discuss with you how we can assist you and your organisation. Respect, meticulous care and the drive to support the further development of your organisation are important and essential concepts in our approach. Sometimes we do this by thinking along about how to get the most out of your employees, for example through training. Other times it proves useful to take a close look at the various consultative structures or to take a closer look at your contact with the outside world. In practice this means that we guide employees on an individual basis, but we may also focus on an entire group or department. After all, each situation requires a different approach. Dialogis does not provide ready-made solutions that should be seen as the ultimate truth. The solutions to you problems and the answers to your questions are only reached through discussion with you and your employees. 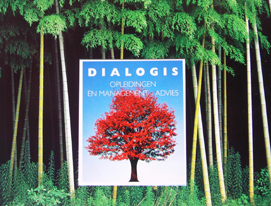 Dialogis's field of action is broad and extends from local government to ministries, from SME to multinationals. You can find more information about our work via the menu at the top of this page.